Hail Mary, beloved Daughter of the eternal Father. Hail Mary, wonderful Mother of the Son. 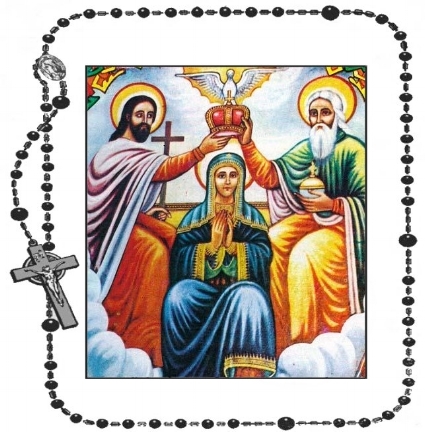 Hail Mary, faithful Spouse of the Holy Spirit. Hail Mary, my dear Mother, my loving Lady, my powerful Queen. You are all mine through your mercy, and I am all yours. Take away from me all that may be displeasing to God. Cultivate in me everything that is pleas­ing to you. May the light of your faith dispel the dark­ness of my mind, your deep humility take the place of my pride; your continual sight of God fill my memory with his presence; the fire of the charity of your heart inflame the lukewarmness of my own heart; your virtues take the place of my sins; your merits be my enrichment and make up for all that is want­ing in me before God. My beloved Mother, grant that I may have no other spirit but your spirit, to know Jesus Christ and His divine will and to praise and glorify the Lord; that I may love God with burning love like yours.